Tonight I’ve been listening to John Piper’s talk on the life of Andrew Fuller at the Pastor’s Conference in Minneapolis. It’s a good talk and can be heard here. Oddly enough, what has struck me most clearly is how he points out, early in the talk, that sometimes the greatest triumphs in life for the Gospel are underscored by major losses. In the life of Andrew Fuller, the foundation of the Baptist missionary society was placed next to the death of his own wife of 16 years. It’s like there’s an apposition placed on the statement of God’s mighty act in the founding of a missionary society and the reminder that the triumphs are ultimately not for this world, if they are said to be triumphs. Dr. Piper then quotes John 12:24 (surrounding verses added for context). Is it strange for me to take hope in that? Reading the news these days, as well as noting the apparent problems in institutions once faithful to the Gospel (such as the Anglican Church), and the way in which radical anti-Christian voices seem ascendant, whether from radical Islam, or radical secularism, and the way in which even those who call on the name of Christ move away from scriptural truth to satisfy modern pluralism, or naive realism; I wonder if believers are being offered the cross. Are we being offered figurative (and maybe more than figurative) death? Throughout scripture we are told that God does things for His glory, and that His power is made manifest in weakness, yet if my own heart is any indication, weakness is the last thing I want. I desire to speak from power, to convince people by the strength of my arguments, and the value of my rhetoric; to impress with the breadth of my knowledge. Weakness is the furthest thing from my mind, and in so doing I remain alone, a single grain of wheat. I say this because Jesus points out that it is God that gives growth, even as we provide the possibility for growth in planting and watering. (see 1 Cor.3:7) I take that to mean that my calling is to be faithful, to do the general work of an evangelist, and as someone strengthening the believers, but that God will give growth. That growth will come from God’s action, not centrally because of my faithfulness, but because of His. And as He promised, growth will come from death (and no, I don’t mean suicidal death-cultism, I mean simple acceptance of what faithfulness entails). Will we Christians in the west see a decline in Godliness, an increase in persecution, and the downfall of many institutions we have trusted? Maybe. Maybe God will do His awesome will before any of that happens, but it is clear that we will be moved away from reliance in ourselves, whether that means catastrophic death of everything that vies for the place God should hold in our lives, or whether that simply refers to wholesale repentance on our part (and a death of idols in our hearts). God will be glorified, and it will be accompanied by the death of all that would take His glory. So when we see decrease in all we have trusted that is not God, and the death of things we’ve seen as good, perhaps we should look with expectation on what God will bring to pass through it. 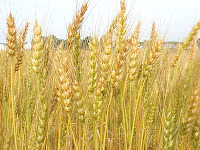 After all, if a grain of wheat remains safe and unplanted, it also remains alone. If a grain of wheat falls to the ground and dies, well, then it bears much fruit. Great post, Steve. We were talking last night about your ‘voice’ and I notice a clearer statement of what you’re saying here. I think the Scriptural illustrations are really a good way of communicating what you’ve got an intellectually impressive understanding of. Now, I don’t encourage your pride, but I do want to say that this combines both mind and heart in a much better way than I’ve seen in some of your posts, and I think that’s what it is you need to focus on.